Dinner in under fifteen minutes? Really! My mom is a big fan of the TV show Chew. I have never actually seen it but she raves about it all the time and one of these days I’m going to watch. Maybe when I’m done working on the Wedding Carnival! She has sent me several recipes that she has seen them prepare on the show and they are always delicious and this recipe was no different. We loved it. We try a lot of new recipes at our house but sometimes you try one that everyone loves and everyone repeatedly says how much they love it, including myself. 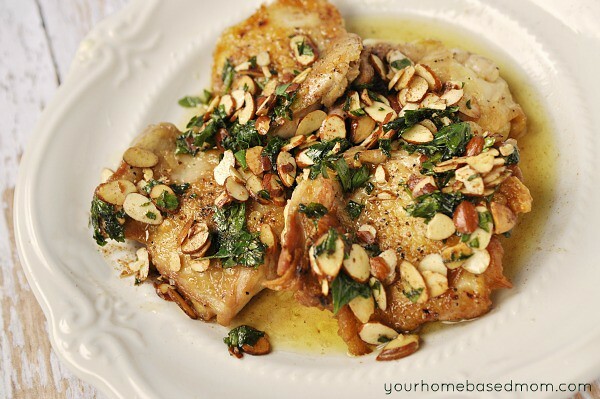 We loved the Chicken Amandine Recipe she sent. Not only did I love it because it was super quick and easy to prepare but it was delicious. I was especially anxious to try it because the recipe uses butter and a few weeks ago I participated in a conference call with a group of bloggers and the rock star blogger herself – Pioneer Woman. Pioneer Woman was sharing with us the ways she has started using and incorporating Land O’ Lakes new Butter with Olive Oil & Sea Salt into her cooking. We tried the butter last week and it is delicious! It combines the flavors of butter and olive oil with a touch of sea salt. Yum! You can use it on just about everything. I have started incorporating it into my recipes that feature butter and love the flavor. But my favorite way to eat it is just spread on bread. So good. Land O’Lakes has a recipe page you can visit for lots of ideas on how to use the new product. Land O’Lakes is sponsoring a great giveaway here on the blog. This is a fun one! Keep reading for details. But first you are going to want to try the new butter with olive oil and sea salt with this recipe. 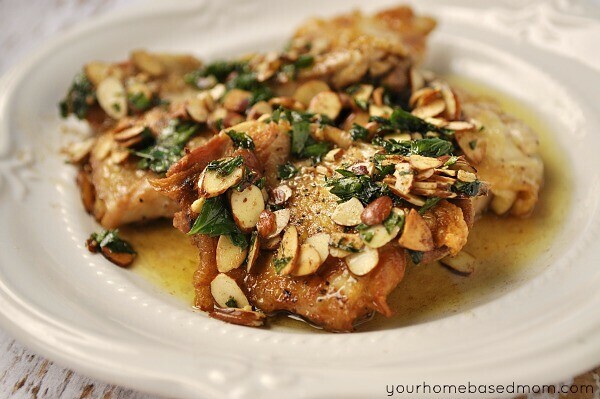 The recipe uses boneless thighs with the skin on. I could only find them with the bone so I cut the bone out. You can leave the bone it but it will take longer to cook so you might not have dinner in under ten minutes. This recipe would also be delicious with boneless chicken breasts. You want the skin on though because that is the star of the recipe. The nice brown, crispy skin that forms. After removing the bone pound the thigh into a uniform thickness. It will also cook faster this way. Give it a nice sprinkle of salt and pepper on both sides. You are then going to add 4 Tbsp olive oil and 3-4 garlic clovesto your frying pan. You do not have to remove the skin from the garlic, just smash it a bit and throw it in. It is just to give some flavor, you are not going to eat it. I used my trusty old cast iron pan. Get the oil nice and hot and add in the chicken, skin side down. Cook for 3-4 minutes until the skin is nice and brown and crispy. Turn over and cook the other side another 3-4 minutes or until chicken is cooked through. Time may vary depending on how thin your chicken is. 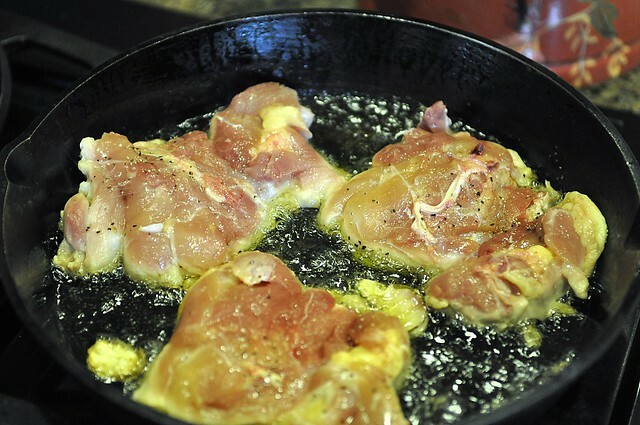 After chicken is cooked through remove from pan to a plate. Drain off most of the oil and toss the garlic cloves. 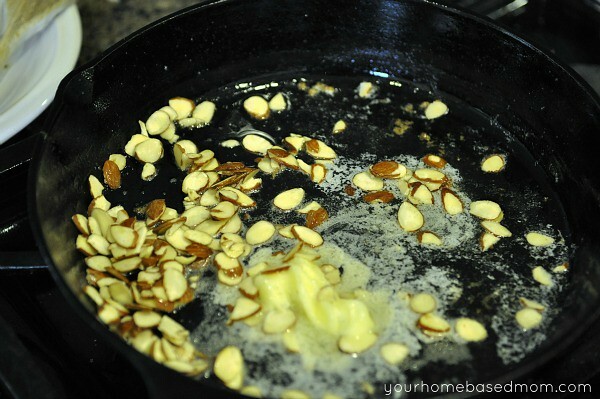 Add in 4 Tbsp butter, 1/4 C almonds and stir until they begin to brown. Add in 1 handful of chopped flat leaf parsley. Add in the juice of l lemon and the grated lemon zest from the lemon. Pour the butter mixture over the chicken. I served it with rice and the rice just soaked up the yummy buttery juices from the chicken. Not only was the flavor amazing I loved the crunch and texture that the crispy skin and the almonds gave the dish. This was definitely a winner at our house and I can’t wait to make it again! And now for The Pioneer Woman’s Cooking Essentials Kit Giveaway! This is a fun one folks! 1. Join Your Homebased Mom on Facebook. Leave a separate comment letting us know you did so. 2. Subscribe to Your Homebased Mom via email. (subscription box on the front page of the blog) Leave a separate comment letting us know you subscribe via email. 4. Follow Your Homebased Mom on Pinterest. Leave a separate comment letting us know you follow. The giveaway is open until Tuesday, July 3rd at 11:59 p.m. PST.The giveaway is only open to U.S. residents. Be sure a valid email address is included with your comment(s). Disclosure: The author received a gift package from Land O’Lakes, including two cookbooks, a whisk, a slotted spoon, tongs and a full-value coupon redeemable for LAND O LAKES® Butter with Olive Oil & Sea Salt, for recipe development and review purposes. All opinions are my own. Recipe adapted from The Chew. In a skillet over medium high heat add olive oil. Place chicken into oil skin side down and cook for 3-4 minutes or until skin is crispy and brown. Turn and cook other side of chicken until cooked through. Add in butter and allow it to melt and foam. 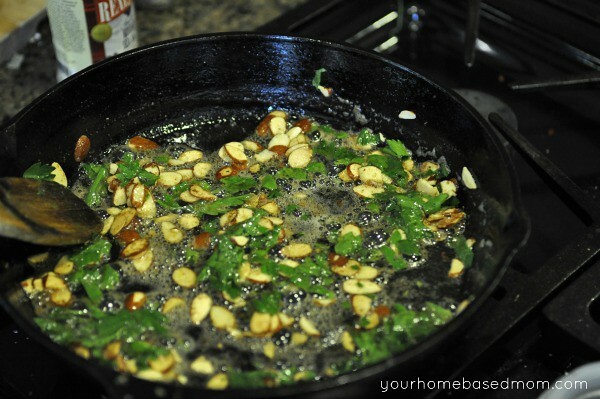 Add in nuts and stir until nuts begin to brown. i like bagels with butter. Cookies! Love them made with butter vs. shortening. Mashed potatoes with lots of butter!!! I also really love Ree’s mashed potato recipe. I love biscuits made with butter. I have a recipe for bars that taste just like Reese’s Peanut Butter cups. Yum!! Everything is better with butter in my opinion!! But I would have to say cookies are my favorite. I am already a follower on Facebook :). I am also already an email subscriber. I love Ree’s Cinnamon Rolls made with butter, butter and more butter. Being from Idaho, we use plenty of butter whipped up in mashed potatoes and all other potato dishes…….Mmm-m-m-m, gotta love butter! “The Best Chocolate Chip Cookies” recipe from Mel’s Kitchen Cafe. Toll House Chocolate Chip cookies. 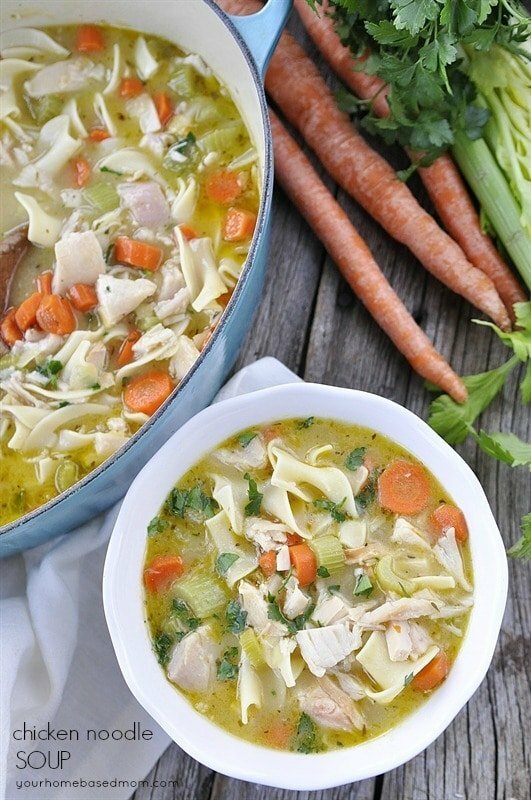 Old recipe but still tastes great every time. You have to love an all american butter cream, the best. My favorite recipe with butter may be cornbread or mashed potatoes. I follow your homebased mom on pinterest. I love to use butter on sourdough bread toasted. I haven’t tried the new butter with olive oil and sea salt; I can’t wait to try it this weekend! Everything 🙂 But I’m definitely a cookie kind of girl. I follow some of your boards on pinterest! I think it’s safe to say I love most anything that uses butter – pastries, cookies, bread . . . I love pretty much any sweet that has butter in it! Its hard to go wrong with homemade fudge brownies, though! Thank you for the giveaway! I love browned butter and mizithra cheese on pasta. I’m an emai subscriber. I subscribe to Your Homebased Mom via e-mail. Homemade croissants! Time consuming but soooo good! Brownies, chocolate chip cookies, corn on the cob, mashed potato’s, sizzling mushrooms, butter makes liver taste good. Subscribed on Facebook. Can’t believe I hadn’t already! Definitely fresh corn on the cob – with loads of butter! My favorite recipe with LOTS of butter, is Pioneer Woman’s cinnamon rolls. Oh. My. Yuummmm… Just made them for Father’s Day. So delicious! I love making Brutzel Bars at the holidays. Already have an email subscription! My family loves chewy chocolate chip cookies with real butter!! shortbread cookies. No question. That recipe looks delicious! I pinned it and cannot wait to give it a try. Of course, I follow you on Pinterest!!!! I subscribe by email, as well. I have joined you on FB as a fellow “like”. I like a ton of recipes that use butter. Right now, the first thing that comes to mind is chocolate chip cookies! Okay this is going to sound very strange but when I was in Switzerland years ago a restaurant put one pat of butter on top of spaghetti and meat sauce that slowly melted into the sauce…It was amazing so I have done that back at home! My favorite recipe with butter has to be buttermilk caramel syrup. We put it on our waffles and pancakes and it is absolutely delish! I am a email follower and now am FB follower. Favorite recipe is the buttery favor of carmels! I like to make Honey Vanilla Compound Butter. It’s yummy on pancakes, french toast homemade biscuits and even topped on baked sweet potatoes. My favorite recipe that uses butter is Banana Sour Cream Muffins. It never fails to please and I am constantly asked to share the recipe. I love cooking with butter, everything just tastes better with butter! My favorite recipe with butter is twice baked potatoes! I am already a subscriber via e-mail! I cook with butter over oil frequently (a hazard of being Southern), but honestly the thing I like to cook most with butter is just sauteed mushrooms and onions. I liked Your Home Based Mom on FB. It has to be my tea biscuits or scones as we call them. They are always a hit and using butter makes them so flaky. But I worry about the cholesterol in butter, so the olive oil butter might be a good alternative. Most of my recipes call for butter but I think my easy 7-layer bars are the best. They not only taste amazing they are super easy!!! I follow you on all of them!!! There is nothing better than browned butter cookies!!! YUMMY! My favorite recipe that uses butter is chocolate orange muffins. My favorite recipe that calls for butter are homemade chicken nuggets! My favorite buttery recipe is shortbread cookies. They almost taste like a pat of butter. The savory butter might work for them as well! Yum! I like Your Home Based Mom on Facebook! I subscribe to the newsletter via email! My favorite recipe that uses butter is Broccoli Casserole. I subscribe to Your Homebased Mom via email. There is a recipe on Annie’s Eats for a tomato sauce that’s made with only 3 ingredients…butter, canned tomatoes, and an onion cut in half. It’s so simple and delicious! Scones. Sweet or savory, cheesy or jammy, onion-y or fruity, scones, scones, scones! You mean there are recipes that DON’T use butter? I use a cube of butter for my English Toffee. Yum yum. I love Pioneer women’s steak bite recipe and so does my whole family! I subscrip to your email letter. I follow your blog via email. Thanks for the giveaway — love it! I love PW! Hmm, I go through so much butter. I recently made popcorn with drizzled 1/2 C butter mixed with 1/2 C brown sugar. It was decadent! My favorite use of butter???? Well, I still can’t decide between spreading on a warm piece bread fresh out of the oven, or at this time of the year spread on fresh and hot corn on the cob! OMG so good..
My favorite way (and where the majority of it goes in our house) is melted on popcorn. I love butter!! and I have to have real butter on popcorn. I will have to try the olive oil and sea salt. I will stop on my way home. Cookies (every kind but especially peanut butter with chocolate chips)! I think you mean Chicken “Almondine”! Actually the recipe is really called Chicken Amandine. I love using butter in homemade cookies! My favorite recipe that uses butter is Chocolate Chip Cookies! I’ve not heard of the new Land O Lakes Olive Oil Butter. I’m looking forward to trying it. The Chicken recipe looks yummy! Thanks for the PW Giveaway! Love her…..
My favorite, Eeeks! there areoo many. I use Butter in most item I bake or cook with. It adds a smoother,richer texture to all my recipes, even GRAVY! With all the fat trimmings frpm the roasted meat, a couple pats of butter just adds a beautiful finish and gloss to the gravy, Try it, you’ll see and absolutely Love it. My favorite butter recipe is shortbread. I am signed up for your email newsletter. Nothing like buttered popcorn. We are great Land O Lakes butter fans so will definitely try this new one – sounds great. My favorite recipe that uses butter is my chocolate chip cookie recipe. It’s too hard to pick just one recipe. 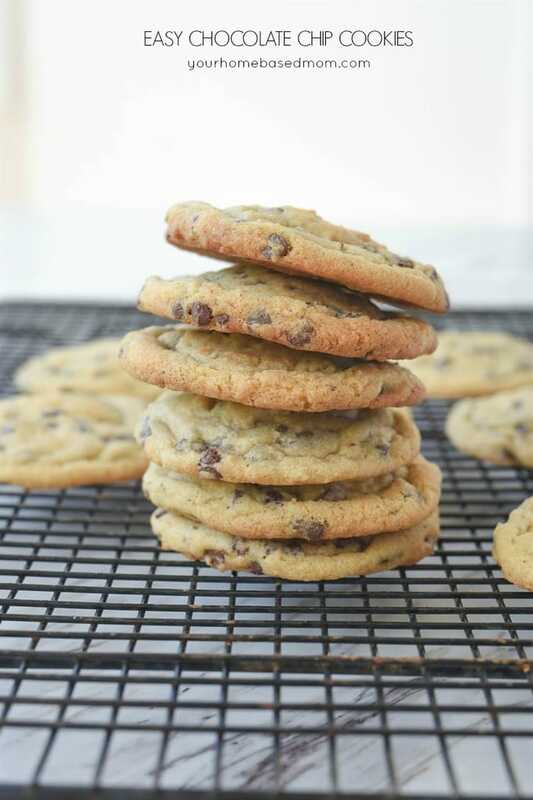 I love to bake and use butter in most recipes so I would have to say chocolate chip cookies – still my old stand by and favorite. I would have to say my favorite recipe that uses butter is . . .cookies. But I also like biscuits. Crepes…you can’t skimp on the butter for these babies! Yum! I love butter on hot bread!!!! Shortbread. I love buttery shortbread. I followed you on pinterest–I want to win the cookbooks! Also, a note about a buttery family recipe…have you ever had Grandma Wilkes’ homemade carmels? The ingredients are butter, cream, vanilla and salt and they are to die for. I only make them at Christmas because I can’t afford the calories all year round. Call me for the recipe and tips if you are interested. My favorite use for butter has to be on good ole air popped popcorn! Cannot live without it! I subscribe by email. I love the texture and flavor of butter. My simple favorite is on toast. My favorite recipe using butter is making honey cinnamon butter and slathering it on homemade buttermilk rolls. I would love to win this package to make my favorite Shrimp Scampi recipe with real butter..
Hard to pick just one because I use butter in EVERYTHING! Probably my fav though is roll out sugar cookies. I subscribe to Homebased Mom via email. Cookies are the best made with butter! My favorite recipe using butter is the classic mashed potatoes. I subscribe to yourhomebasedmom via email. My favorite recipe that uses butter………I like to grill an onion with lots and lots of butter and a pinch of Mrs. Dash!!! Oh my it is soooo yummy. I just started following you on pinterest!! Oh, that’s a great give away! I make a chicken teriyaki dinner in the crockpot that uses a whole stick of butter. yum! Love butter on my homemade bread and in choco chip cookies! I have a blueberry muffin recipe that uses a stick of butter that could win blueberry muffin contests!! Yum! It would have to be the waldorf astoria red velvet cake. 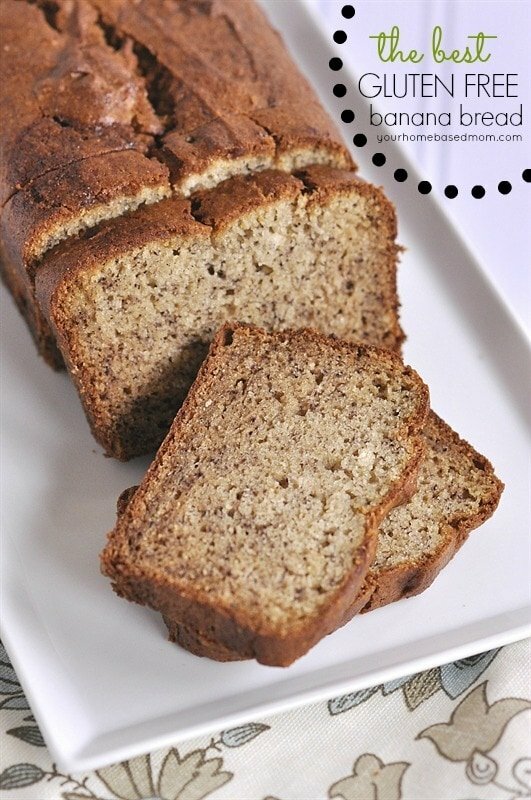 It is a family recipe and my hubby absolutely loves this cake. My favorite recipe that uses butter is Paula Deen’s Gooey Butter Cake – yum! I am an e-mail subscriber and look forward to the daily e-mails and pictures! Also LOVE Pioneer Woman! I also liked you on facebook!! I’m now an email subscriber. and I just liked you on facebook! I follow you on Pinterest!! Have been for awhile! I don’t think I could pick just one fav recipe that uses butter. More like which one doesn’t!! Hope about a nice pad of butter on blueberry pancakes. I made that last weekend, yum!! Nothing is better than butter on a fresh hot roll! I already subscribe to you. My favorite recipe with butter is good old fashioned chocolate chip cookies. Favorite recipe using Butter: Bread!